I have had an interesting time working on getting our school area a way that will work for us since moving our school from the entire main floor to the lower level. We first set the room up so that all the toys were upstairs and the whole area was the school room. That didn’t work well, since the little boys would sneak down and make a huge mess of the room. We later decided to change the room around again and make half of the room a school room and the other half a sensory motor room. We decided that we really needed an area for the kids to get their energy out during the winter and on rainy days. This set up worked good for about a couple weeks… Then the kids would trash the school area while down playing and we would spend our first half hour every day picking up our school room to do school for the day. This is what our school room/ sensory motor room looked like before I rearranged it. Here is the new playroom/ Sensory motor room. We brought all the kids toys from upstairs into the playroom and have them stored in the Trofast drawers from Ikea, I have to admit, I love our Ikea Trofast storage they are nice storage and easy to keep clean! I am planning on adding labels to each of the drawers with a picture of what is in each of the bins, I will be adding those pictures above where each of the drawers goes so the kids know right where to put the bins back when they are done. I have a few of our big fire trucks on the top and a couple baskets of toys, both of which I change out once and a while with other toys from storage. The second one with wooden Melissa & Doug wooden cars & trucks. We made a little hideout in the corner of the toy drawers, and the boys have just loved it. They have put a bean bag, pillow, and blanket inside and love to just sit in there! 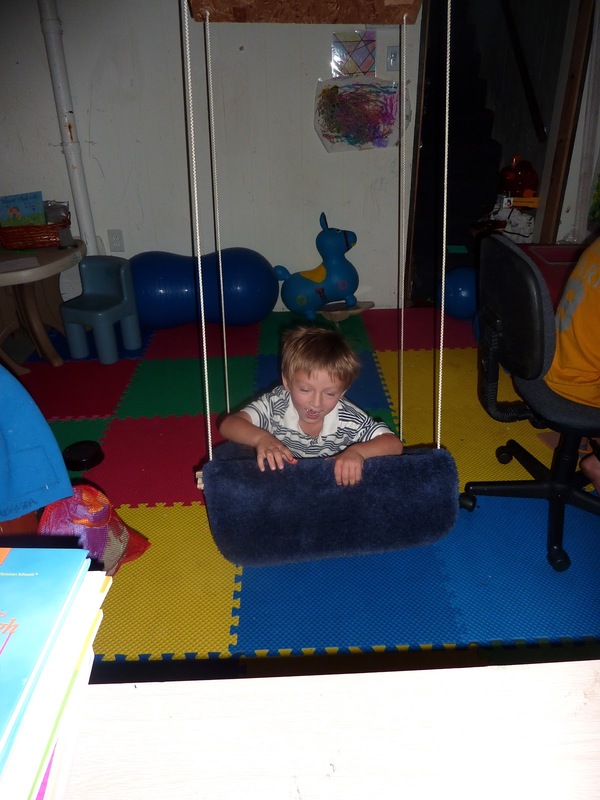 Here is an overview of the sensory motor room side this room. 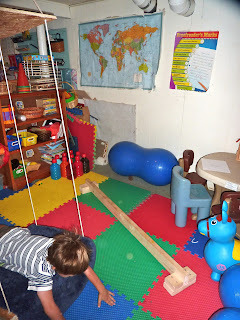 On the far wall we have our giant peanut ball, our keyboard the little boys use for Kinderbach, a swing to change the sensory motor swing out, and a lap table to help the little ones sit and work. Here is another overview of the sensory motor room. Here we have our pool of balls, rody ball, 2 hop balls, our DIY Sensory Table, and then our tunnels against the wall behind the sensory table. Our DIY felt board is hanging on the wall now, finally. Here is an overview of this wall, the green Ikea Trofast drawers used to be our Tot Drawers, they now hold some of the smaller pieces and people for the different Imaginext sets we have. This makes finding things so much easier, those are going to be labeled just like our other toy drawers. This is our only desktop computer desk for the kids, the basket on the table holds the kids computer games. We also keep our CD player on the desk. We have taken our Ikea easel apart and put the marker board side on the wall, I am going to be adding something to put the markers and erasers in soon. Below the easel is our scooter board, which is something the boys love using! Our DIY Sensory Motor swing is very loved and used regularly by most of the kids! Here is an overview of the far wall in the room. The built in shelves are storage for our sensory items, books, puzzles, and coloring books for now. Here is our chalkboard and our Mindware marble run in the corner of the room. Behind that door is a place we call “cold storage”it has no insulation and is very cold. That is where lots of my misc school stuff has gone which I will explain more when I reveal the new school room. In the built in shelves on the top shelf I have put all the misc sensory toys the middle shelf originally had puzzles and themed books along the back, and the bottom shelf held coloring books. Since taking this picture we have put all the themed books into a dishpan that has a themed label on the front, and the puzzles have gone back on the puzzle rack so that when they want to use a puzzle they need to ask a big kid for help to get it down. The coloring books on the bottom shelf have also been put into a dishpan. Having to expect the kids to put the things away on the shelves and also expecting them to not get put all around the room was just to hard when having everything laid out. On the top shelf is a puzzle rack with some of our preschool puzzles, our DIY bowling pins, and cones. I am going to be adding a picture behind each of the sections of what should be where on the shelf, so that the kids can easily remember where they took each of the toys off the shelf from and properly put them away. Next week I will be revealing our new school room, along with the new storage shelves my wonderful hubby made me for the school room and for our storage room. Looking for some great storage ideas? Visit my Pinterest board School Organization Ideas for some wonderful storage ideas! ← Disney On Ice Celebrates 100 Years!! Wow! I love your sensory/play room. 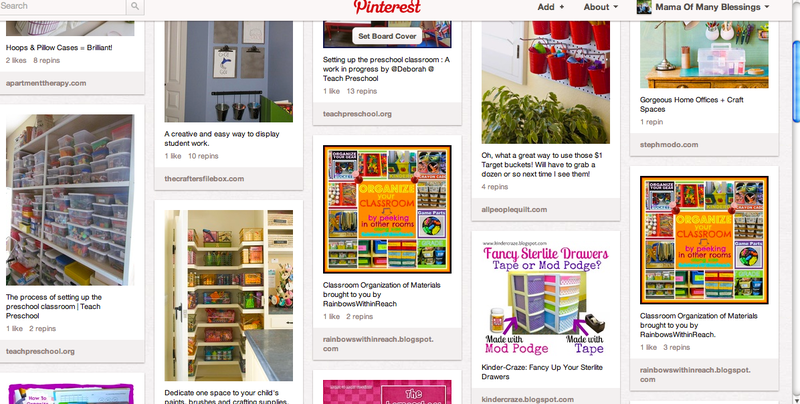 We will be setting up our playroom/school room soon and I got lots of ideas from your post. Thanks. Thank you for stopping by and your kind words. Good luck on setting up your school room/ playroom, I would love to see it when your done! Hope you have a wonderful week!! Looks like a great room Momma!! Thank you!! Thanks for hosting Sharing Saturday! Hope you have a great week! Wow! My kids would love a room like that. I have some of the Ikea Trofast toy storage units too and love how they contain toys yet it’s easy to take out a bin to play with something. Great job of organizing. I’m heading over to get some more ideas from your pinterest board. Thanks for sharing. Yes, I love our Ikea Trofast storage!! Thanks for stopping by and for your kind words! Hope you have fun over at Pinterest, I love Pinterest!! Wishing you a blessed week!! Looks like a fun room to learn and play in, Mama! Great job! Saw your post on Hearts for Home blog hop (Upside Down Homeschooling). Thanks for sharing! Love what you have done with your organisationand it all looks so inviting and colouful! 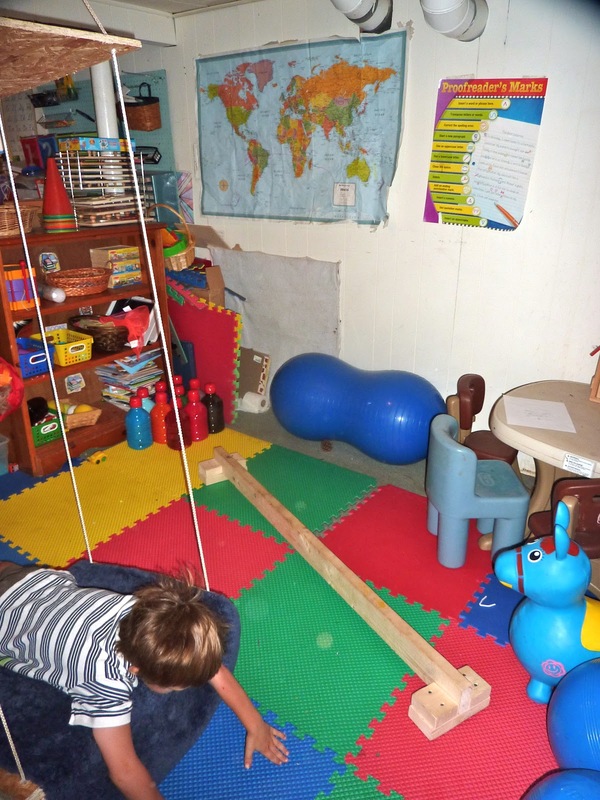 Your sensory space is fantastic…i am working on something similar for my twins. Would love to build your swing! Thanks for sharing so much inspiration!! Your play room looks like so much fun! I want to play too =-) And it is so organized – love it!